Credit goes to it’s rightful owner. Weeks from now, Eagles QB Michael Vick is expected to be released from the team and may end up on the Jets according to multiple sources. Ian Rapoport of NFLN reported on Monday that the rumors of Vick going to the Jets are a “legitimate possibility” and that it could provide a young Geno Smith a helpful resource. If Michael Vick were to end up in NY, he may in fact take the position of QB David Garrard who will most likely get cut when free agency starts. Garrard was the fourth QB on the roster (3rd on the active roster) and was inactive the entire season to basically mentor the other quarterbacks on the team. The only problem with Vick possibly landing in NY is that he wants to be a starter. This past season, Vick was essentially benched for QB Nick Foles. Foles excelled to the point where it started to stir up questions on whether or not he can be the longterm quarterback. The Jets want Geno Smith to be the longterm answer but only time will tell on whether or not he is the go to guy moving forward. Per other sources, reason why Vick may come to the Jets is to reunite with his former offensive coordinator Marty Morhinweg, who is now the OC for the Jets. 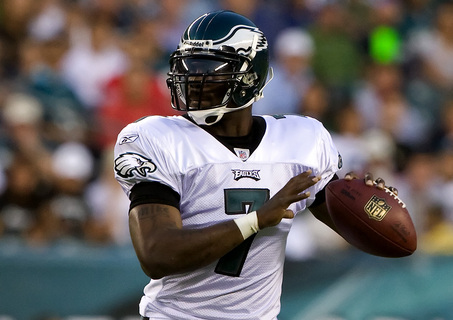 Vick worked under Morhinweg for four years in Philadelphia. Tags: Eagles, Jets, NFL. Bookmark the permalink.